A new study led by Vijay Krishna, PhD, Lerner Research Institute Department of Biomedical Engineering, offers an innovative, feasible and cost- and labor-efficient solution to a problem that challenges many healthcare systems: hospital-acquired infections. The researchers show that a chemical compound, when exposed to visible light, can effectively degrade organic surface contaminants. This discovery may help improve patient health, hospital readmission rates and operating costs. Pristine titanium dioxide (TiO2) is a chemical compound with many commercial uses ranging from paint pigment to sunscreen to food coloring. It is a photocatalyst, which means it accelerates chemical reactions when exposed to light. TiO2 photocatalysis has been of great interest because it can mineralize contaminants without producing harmful byproducts, opening the door for application as a safe antimicrobial surface coating. Up until now, TiO2 photocatalysis was only possible when the compound was excited with ultraviolet light, posing a significant barrier for wide-spread adoption of TiO2-based coatings. For the first time, this team of scientists show that contaminants such as bacteria can activate their own degradation when in contact with TiO2 and visible light. Using this technique, they engineered a common coating for indoor surfaces that effectively killed concentrations of the bacteria Staphylococcus aureus. The researchers coated tiles with TiO2 before adding S. aureus, the model bacteria, which absorbs very low levels of visible light—the wavelengths and colors on the electromagnetic spectrum perceivable with the human eye. 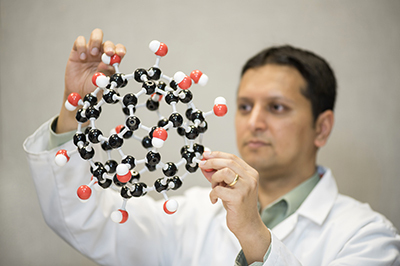 Dr. Krishna and his team discovered that in response to visible light absorption, electrons were transferred from the bacteria to the TiO2, which helped create unstable and highly reactive oxygen species that effectively degraded the bacteria. They also found that rate of degradation directly correlated with the amount of visible light absorbed. The researchers developed a stable TiO2 formulation that could be easily spray-coated and applied to different surfaces in a test facility. They applied the coating to six different surfaces contaminated with S. aureus and found it reduced the bacterial concentration to benign levels on five of the six surfaces, with effects lasting for 12 months. Importantly, during the first six months of the study, the incidence of acquired infections in the test facility was reduced by 55% compared to previous year. This finding suggests a TiO2 photocatalytic coating may be an effective strategy to reduce the presence of pathogens on hospital equipment and surfaces, and could thereby reduce rates of hospital-acquired infections. Other applications include degradation of organic pollutants to improve air quality and fight the spread of surface-transmitted infections in public places including schools, public transport systems and cruise ships. This study was published in Scientific Reports and supported by funds from the National Science Foundation and the Cleveland Clinic Foundation. The research was conducted in collaboration with the University of Florida, Gainesville.